After shooting the first free roll of 120 film in the FPP Plastic Filmtastic 120 Debonair, I was anxious to try something new. I decided to do some sprocket hole photography. What is sprocket hole photography? It’s a method where you use 35mm film in a camera that normally uses medium format 120 film. The result is a style where the image displays the sprocket holes in the 35mm film because the camera has exposed the full width of the film. 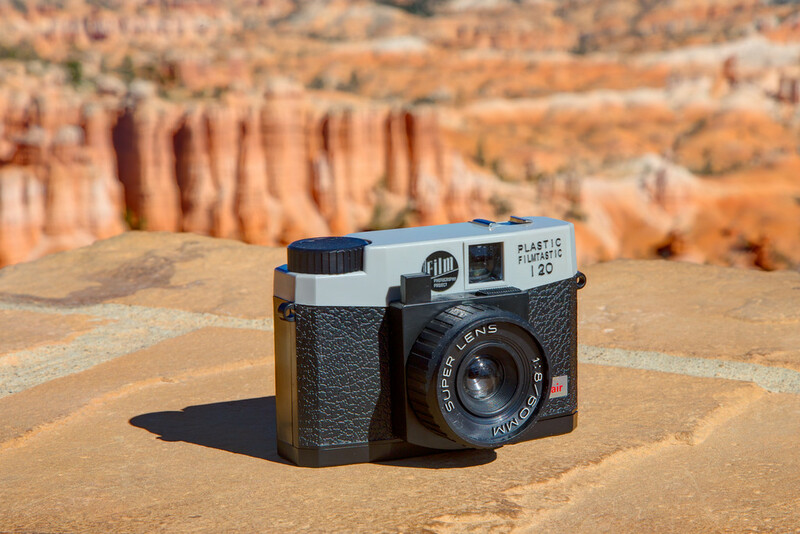 To use smaller film in the camera, you can modify the camera, or modify the way the 35mm film is held in place. Either way, if the camera or spool is hacked, it’s critical to ensure film is centered as it passes behind the lens. Before I loaded film into the camera, I took two pieces of black electrical tape and blocked out the red frame indicator window on the back of the camera. This is done because 120 film has a paper back, 35mm film does not. If the window isn’t covered, the 35mm film will become exposed to light. Without a number in the window, how do you know what frame you’re on? A little guesswork, but turning the takeup spool about 1 ¼ turns advances the film far enough to be safe without overlapping on the previous image. A 24 exposure roll should yield about 17 images. I was probably winding too far, I only shot 12 images on a roll of Kodak Gold 200. Earlier this year I purchased some adapters from Pinhole Printed. These 3D printed adapters attach to the 35mm film and center the film in the perfect spot. They allow the film to unwind from the canister and move to the take up spool without having to modify the camera. There are several hacks you can find on the internet that basically do the same as these 3D printed spools. I liked the idea of using the spools because they’re cheap and they fit snug on the 35mm film canister. The only problem I had is the size of the spools. They’re meant to fit in most cameras, and because they fit so snug in the camera, I had problems after the first eight shots. I found myself really cranking the camera to advance to the next frame. Before I use the adapters again from Pinhole Printed, I’ll need to sand them down and make them a little smaller. I found that storing the adapters in an empty plastic film canister kept them from getting lost in my camera bag. Shooting sprockets on the FPP Plastic Filmtastic 120 Debonair was fun. I spent the day in Bryce Canyon National Park, Utah, with my family. I love the vivid blues and golden browns in my photos. This is exactly what I expected from a toy camera with 35mm film. In the past week I purchased a Holga 120N camera. I think I’m going to come back to the Debonair to shoot sprockets over the Holga. Why? The Holga back and body doesn’t seal as well as the Debonair. Without trying, I can see that shooting sprockets on the Debonair is easier than the Holga. On the Debonair, you only have to block out the frame indicator on the back of the camera. 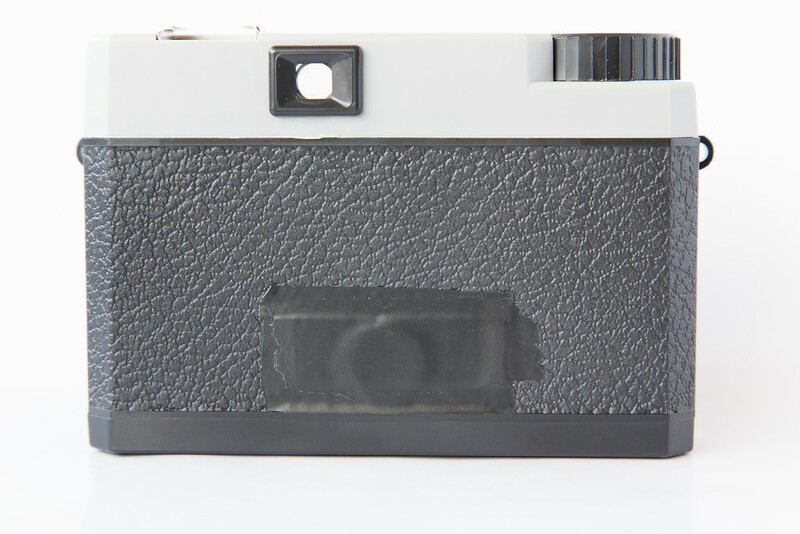 The Holga will require blocking out the window, and covering half of the camera in gaffers tape to ensure light doesn’t leak to the 35mm film. Removing film from the Debonair versus the Holga would be much easier too. Because the 35mm film is now on the 120 takeup spool in the camera, it’s necessary to manually rewind the film back inside of the 35mm film canister. This can be done using a film changing bag or dark room. I took the Debonair into my dark basement, opened the camera, and removed the 35mm canister with the adapters still attached. Next I carefully removed the 120 takeup spool and rewound the 35mm film back into the camera. Going back to my earlier comments about the Debonair versus the Holga. When I rewound the film, I was doing it in complete darkness. With the Debonair, it was only a matter of flipping the latch on the bottom of the camera and removing the film. On the Holga, I would need to remove all the gaffers’ tape, in the dark, before opening the camera and rewinding the film. This entry was posted on Tuesday, November 18th, 2014 at 5:38 PM	and posted in 120 Film, 135 Film (35mm), FPP Plastic Filmtastic, Holga, Lomography. You can follow any responses to this entry through the RSS 2.0 feed.